← Want some free music? You know how every once in a while I talk about how something in my environment triggers a loosely-related memory? I had a really strong one of those yesterday. I was listening to Firehouse at work, and for whatever reason, it brought up memories of Mega Man Battle Network 4. If you’ve actually paid attention to my ramblings over the last however many years, you know that Battle Network 4 and I have a rocky relationship. In fact, I might even say that I hate it. It is, by a wide margin, the worst in its series. And that’s mostly because it’s overdesigned and padded all to heck. However, when we started out, MMBN4 and I got along fairly well. The Mega Man Battle Network series was an annual release for the first six years of the Game Boy Advance’s lifespan. I got in on the second installment (which many rightly consider to be the best), and lured the eldest of my brothers into its grips before long. From that point on, we would eagerly await the release of the newest entry each year and spend the summer playing through together. 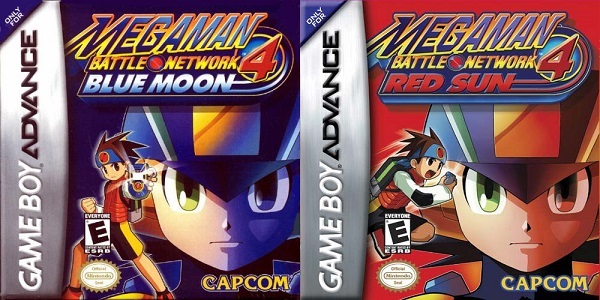 Battle Network 3 made playing parallel to each other even better, when the series started launching two alternate versions with each entry. BN3’s version differences were minimal, very clearly shoehorned in to sell a few more copies to people who would double-dip. From then on, each game’s alternate versions would be very different, with similar stories that had a few key differences, and vastly different rosters of boss characters to fight. But that’s just the background here. I figured it was important for you to fully appreciate the rest of my tale. I jumped on MMBN4 early, as it was released in Japan a good half-year before it came to the West. I downloaded the Japanese version and started hacking away at it, using a guide to progress past points where fumbling around simply wouldn’t be enough. You know, I really miss the days when I could keep up with (portable) game releases through emulation. I know it’s wrong, and I’ve always been a proponent of buying games legitimately, but it was handy for playing imports and otherwise trying before I bought. Long story short, I managed to slake my thirst for new Battle Network, but didn’t really get the full experience, so my feelings for the game were mostly neutral. It played more or less like those that had come before, so it mustn’t have been too bad. Right? I mostly recall this period fondly because it was the point in time where I had decided that I was going to tech myself to read katakana. I took screenshots of the game’s text entry screens, and made diagrams and stuff on how to decipher the moon language. I didn’t really succeed, as I still can’t actually read katakana. But I did learn how that particular syllabary works, and a little bit about the Japanese language in general, so I came out with more knowledge than I went in with. Good for me! The game slipped from my attention until summer came. I remember the day well. My family was going out to Montana’s for dinner, and my brother and I were itching to see if any nearby stores had gotten MMBN4 in yet. So as we were waiting for our food, we dashed over to the nearby Wal-Mart, and there they were: Mega Man Battle Network 4, Red Sun and Blue Moon versions. We were elated. Then the game proper started. The Battle Networks always have dumb stories. But the gameplay is generally very solid and makes up for other, less important shortcomings. MMBN4 made a number of changes for the worse, though. Firstly was the fact that you had to play through the game a total of three times to actually finish it. Yeah, you’re in disbelief right now. So was I. See, how it works is that normally in these games, enemies (“viruses”, as the core gameplay takes place in a digital world) ramp up in difficulty over the course of the game, and you can fight every boss, whether compulsory or optional, through regular gameplay. MMBN4, however, uses a [lame] battle tournament as the base of its story. So, you only fight a handful of the bosses your first time through. Regular enemies remain at their base strength from start to finish. Once you’re reached the “ending,” you unlock Hard Mode, which swaps out enemies with their level 2 versions, and gives you a new crop of bosses to fight. Repeat again on Very Hard to put viruses at maximum strength and finally see the last bunch of bosses. Why is this a problem? Firstly, a certain number of the items scattered around the world are unique to each difficulty level. So if you miss some upgrades on your first run, they’re lost forever once you overwrite the single save file on the next difficulty. Also, viruses drop battle chips (special collectable weapons) based on their strength level, so you have to make sure that you have a “full” battle chip library before you move onto the next playthrough if you want to go for 100%. If not, you may be totally out of luck again. Compounding the problem is the Double Soul system. 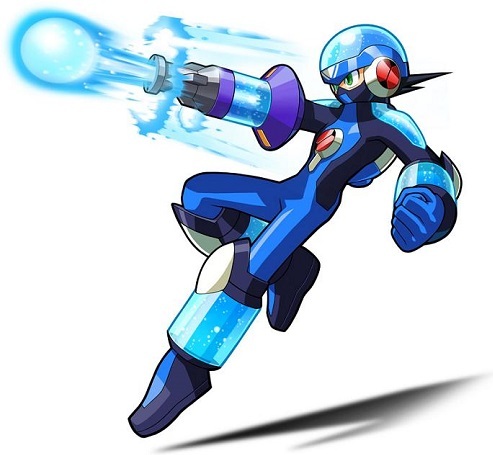 In the previous two games, you were awarded a “style” based on your combat tendencies that gives Mega Man a new appearance, an elemental alignment, and other abilities. You’d be given the chance to change styles after every so many battles, and could keep your two favourites in memory to swap freely between. You have access to styles at all times, and they cost nothing to use. Double Soul, on the other hand, must be earned by getting to a certain point in the story of MMBN4 and defeating a certain boss. A select number of bosses grant Double Souls, and the downside to this is that the one you want may not become available until the very end of your third playthrough of the game. Compare to styles, all of which you are able to earn at any time in MMBN 2 and 3 as soon as the ability to style change becomes available. Not that Double Soul is overly useful anyway. You have to activate it whenever you want to use it, and that’s done by sacrificing a compatible battle chip. Even once a soul is active, it only lasts for three turns before it goes kaput and you’re back to regular Mega Man until the next battle. Random battles won’t often last more than three turns, but bosses have to potential to go on much longer, so you really have to pick and choose when to use your Souls. They do have more distinct features and abilities than styles, but overall I’d say they’re less beneficial to gameplay. Finally, there’s the weird mood meter. I don’t remember how it works, but Mega Man’s mood can change during the course of the game. If he’s happy, you get powered up. If he’s anxious, your battle chips may be replaced with Dark Chips. Dark Chips are awful. They are thoroughly overpowered, and break the game’s balance into tiny little pieces. In an effort to curb their use, they also permanently decrease your HP by one every time you use one. On top of that, they cause a bug (status effect) for Mega Man each time one is used. Dark Chips are basically drugs. They offer a “benefit” but cause many other problems for you. On top of that, the more often you use Dark Chips, the more often they show up. Mega Man’s soul becomes tainted, and you can’t use Double Soul any more. I guess it’s one way to play the game, but it seems like there’s no good reason to use Dark Chips at all, unless you want to challenge yourself by playing with a handicap that gets increasingly worse over time. In the end, I didn’t even make it to the true finale of Mega Man Battle Network 4. I think I probably cleared two playthroughs, but it just wasn’t worth it to keep slogging my way through. To this day, the worse-than-usual story and the silly gameplay add-ons make me cringe at the thought of the game when it comes up in conversation. And I didn’t even mention the awful, tedious, collect-all-the-invisible-items quest that you have to do early in the game. Of course, I’m pulling all of this information from memory. I haven’t replayed the game at all, and I don’t intend to. I’ve been eagerly anticipating the Virtual Console re-releases of the Battle Network series on Wii U, but I’m definitely skipping MMBN4. And probably MMBN5 as well. It was an improvement, but still not so hot. I have said maybe one nice thing about MMBN4 in the last decade. Which made it odd that it only felt like a happy memory when it popped into my head yesterday afternoon, though the pleasantness of it probably had more to do with reminiscing about a simpler time than thinking about the game itself. I guess I’ll take that for what it’s worth. Bonus Fun Fact: You wanna know the weirdest part of it all? My preferred online handle, “TheRyanDS,” is not a reference to the Nintendo DS, but rather to a feature of Battle Network 4. I forget the details of it, but for every boss in the game, there exists two alternate, harder forms: Special, and Dark Soul. These versions are respectively abbreviated as SP and DS. For example, the toughest version of AquaMan is known as AquaManDS. I used to go the whole way and call myself RyanManDS, but for whatever reason it got shortened and officialized. And that’s the end of that story. Pretty ironic, yeah?